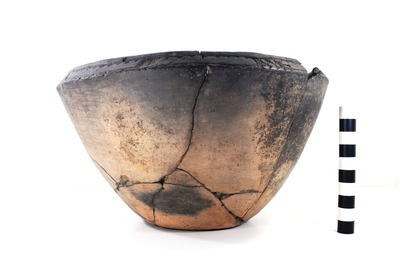 "41HS261, 2003.08.625, Burial 6, Vessel 21" by Timothy K. Perttula and Robert Z. Selden Jr.
DECORATION (INCLUDING MOTIF AND ELEMENTS WHEN APPARENT): The rim has four elongated oval engraved panels with upper and lower rows of small excised pendant triangles. The panels are divided by cross-hatched engraved brackets. Simms Engraved carinated bowl, Burial 6, Vessel No. 21, J. O. and Henry Brown site.